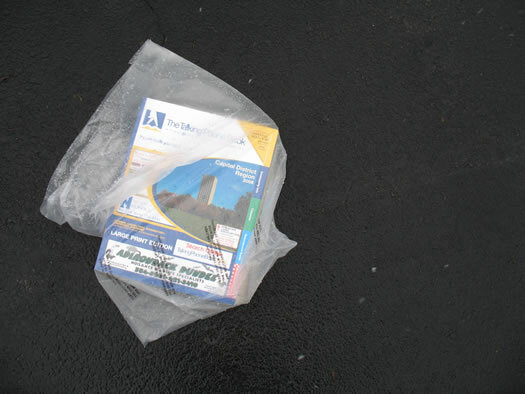 A phone book sits, unwanted, in our driveway last week. We can't remember the last time we used a phone book to actually look up a number, or really do anything. (About four years ago we used one to elevate a computer monitor -- that actually worked pretty well.) But the phone books just keep on coming. We just had two new ones plopped on our driveway during the last month or so. We did exactly that this morning. We didn't get a confirmation email or anything in return, though. Then choose option number 2. You'll be connected with a customer service rep. Tell them you'd like to be put on the "do not deliver" list for Yellow Book. The rep will then ask you for your address, phone number and name. And that's it. In a similar vein, catalogchoice.org "allows you to decide what gets in your mailbox. Use it to reduce your mailbox clutter, while helping save natural resources." By the way, anyone willing to provide an over-under on how long paper phone books will still be around? I give 'em five years max. The phone book holding up my computer monitor works great!